Perched majestically on the site of Deerhurst Resort’s original lodge built in 1896, is Lakeside Lodge, the first new accommodation style at the resort in almost two decades. Reservations are now available in select units for stays starting June 28, 2019. Artist renderings – styles, sizes, décor and furnishings vary. Cosy and compact, this room is ideal for active couples looking to put their feet up and relax after a busy day outdoors. The studio style includes: King bed, kitchenette, dining table, couch sitting area, bathroom and balcony with resort view. A variety of layouts and styles are best suited for double occupancy. 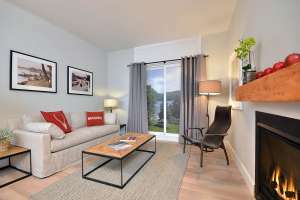 Each one-bedroom unit includes: Living room, fireplace, dining area, kitchen, bathroom and balcony. A variety of layouts and styles ideal for families or a group of friends. 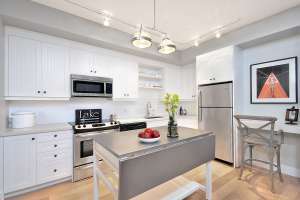 Each two-bedroom style includes: Living room, fireplace, dining area, kitchen, bathroom (most have two) and balcony. 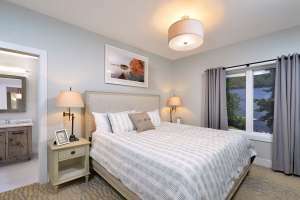 The largest condo suite is perfect for families or groups of friends who want to stretch out and enjoy spacious living quarters with the privacy of separate bedrooms. This style includes: Living room, fireplace, dining area, kitchen, two bathrooms and balcony with lake view.